Multiple blasts in the Japanese city of Utsunomiya have killed one person and injured three, emergency services say. Police believe the blasts may be linked to an apparent suicide. The explosions took place almost simultaneously at about 11:30 local time (02:30 GMT) in the city in Tochigi prefecture, north of Tokyo. Two cars in a nearby parking area also caught fire at the same time, police said. The Japanese broadcaster NHK says police found a suicide note at the scene, and one of the damaged vehicles was owned by a 72-year-old man, believed to be a former member of the Self-Defence Forces. His house in the city of Utsunomiya had been destroyed in a fire shortly before the explosions, the broadcaster said. The blast in the nearby park seriously injured two men, and a 14-year-old boy suffered minor leg injuries. No-one was injured in the car parking area. A festival celebrating traditional culture had been taking place in the park. A man who was there at the time told NHK that he heard "a big sound" and smelled gunpowder. 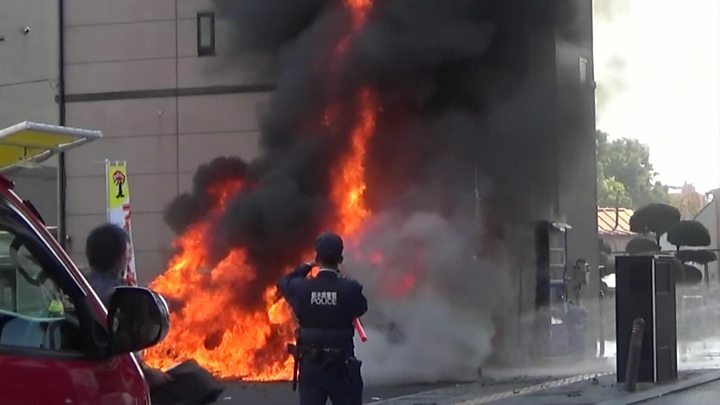 The broadcaster also reported that a video camera at nearby Utsunomiya station recorded the sound of three explosions in quick succession - at 11:31, 11:32, and a third "bigger sound" 15 seconds later. Photographs showed a splintered and broken bench in the area of one of the blasts, while other images posted to social media appeared to show a column of black smoke.